On walking through the doors of Hotel Meyrick an immediate sense of calm envelopes you. It is quiet and serene with a roaring fire in the foyer, a place you could easily sit and while a few enjoyable hours away. The hotel manages to capture the perfect balance between modern and old world elegance. Quite simply the Hotel Meyrick is pure class. It is always a good time to take a hotel break. Relaxation and a change of scenery will never go out of fashion. Adjacent to both Galway's train and bus stations, making your way to this classy urban retreat could not be any easier. Sit back and let others worry about making the beds and cleaning up after meals. Hotel Meyrick's Eyre Square location means it is perfectly situated in the heart of the city for exploring, shopping, and indeed enjoying Galway's world renowned atmosphere. The venue is offering an ideal autumn or winter break option with its ‘Sunday Saver’ package. Check in on Sunday afternoon and indulge in some pampering, with two nights of luxurious accommodation, a delicious table d’hote dinner in the hotel restaurant- No 15 on the Square, and enjoy complimentary access to the Square Spa & Health Club, where you can work up a sweat, meditate in a relaxation room, or soak away your stresses in the outdoor hot-tub. This deal is available from just €100 per person sharing and considering the quality of this hotel, it is definitely exceptional value. We went along to sample the delights of the Meyrick and enjoyed our three-course dinner on the Sunday evening of our stay. It is no understatement to state that the food was amazing - our dishes included a gorgeous creamy seafood chowder, Irish beef fillet - which was melt in the mouth tender, and the same could be said for the organic salmon. For sweets, the chocolate fondant is a chocolate lovers heaven while the classic lemon tart was the perfect mix of sweet and zesty. There is no doubt that it was one of the tastiest meals we ever had. It is a hotel with so much character and charm, I wished we were staying for a week. The luxurious room overlooked Eyre Square, and it brings home that it really is an unreal location from which to soak up all Galway has to offer. With the Galway Continental Market beginning in mid November it is the perfect time to book into Hotel Meyrick and enjoy some pre-Christmas shopping. Wake on Monday morning feeling refreshed and enjoy a full Irish breakfast. Similar to the experience in No 15 restaurant, everything is so tasty - cooked to order and of the highest quality. Our party of two declared it the best hotel breakfast ever. All kinds of dietary requirements are catered for, and if you are bold and ask for a sneaky pancake there is no problem. 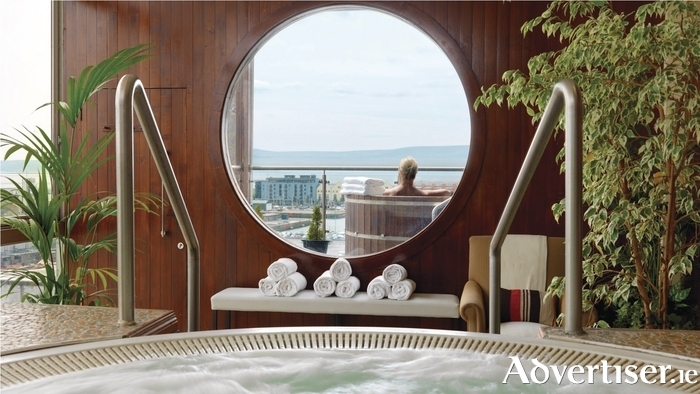 With a very satisfied full belly, and for the ultimate in pampering, hop into the elevator to Level 5 at Hotel Meyrick, where the Square Spa & Health Club promises an experience like no other; overlook the Galway skyline while relaxing in the outdoor hot-tub. It is also worth taking note that the Square Spa offers a whopping 50 per cent off all treatments on Monday and Tuesday (subject to availability ), so it is well worth checking out the extensive treatment list which includes a full range of facials and massages. These fabulous treatments are truly exceptional value at half price. All that will no doubt whet the appetitite again so why not indulge in hot chocolate or some afternoon tea in front of the aforementioned fire, or indeed sip a cocktail in the Gaslight Bar & Brasserie. Speaking from experience, you are guaranteed to enjoy the perfect winter break at Hotel Meyrick.